In my last tutorial I very briefly introduced Zanti , but in this tutorial I will start to show its many features. The first step on hacking is recon . You could use Nmap , but the problem with Nmap on Android is that by itself, in order to gain full functionality your phone must be rooted. 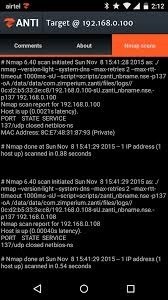 Thank goodness for a few geniuses in Zanti's dev team whom managed to implant full fuctionality of Nmap in Zanti without rooting your phone. With that being said, boot up your Android phone and lets start wrecking havoc, or not. A lot of the 'full' functionality in nmap requires you to have root access. The Zipmerium team did not include those functions within the Zanti 2 app. But fair play to them, they managed to present nmap in a beautiful GUI layout. Judging from the screenshot, the scan is most probably nmap -v -sT -sV at most. You explained it well though, good job. Hello I'm having a problem, and i'm French so sorry for my English ^^ When I execute scan I haven't scans Nmap and when I watch scan logs there is "NMAP failed to run: NSE failed to initialize the script engine: ... did not match a category ..." Help !